Every now and then I read one of those rare books about which I have little to no criticism, only enthusiastic praise. BURNING MIDNIGHT is one of those books. Sully is a welfare kid who almost struck it rich. In this new, strange world colorful spheres hide all around the world. Find two of the same color and you can burn them for some kind of personal enhancement: smarter, taller, stronger, faster. Each color does something different, and the rarer the sphere the more someone will pay for it. Sully has a humble booth buying spheres from hunters and selling them to collectors for a small profit. Then one day he found a sphere himself, a precious rarity, and made the mistake of selling it to a billionaire collector who manipulated the fine print of the purchase contract to cheat Sully out of the millions that would change his life. But, as they say, that was then and this is now. Other than an annoying level of fame when someone recognizes Sully as “the poor teenage sucker who was ripped off for millions” his life went back to normal. Well, except he and his mom may not be able to afford their apartment much longer and might have to move far away and into a family member’s basement. The book opens with Sully meeting Hunter, an edgy teenage girl with a knack for finding spheres. Their professional relationship shifts into an actual friendship as they work out a pact to search together and split the profits. Then they find something no one has ever found before and their discovery takes them on a wild adventure of unexpected twists. 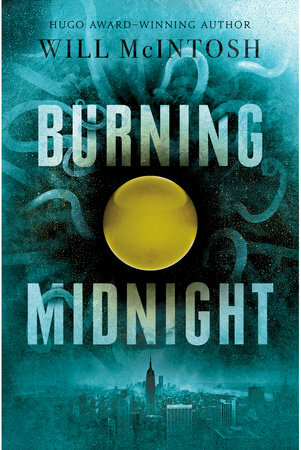 I especially loved BURNING MIDNIGHT because it constantly subverts expectations in subtle ways. From character behavior to plot development, when you think you can see the road laid out in a pristine straight line ahead of you - well, it’s a mirage. There’s always another bend in the road. I also admired many of the themes woven skillfully into the story. Class comes to the forefront. Not only because someone filthy rich ripped off a broke kid like Sully, but also because Sully has a lot of self-pitying thoughts for his circumstances...until he meets Hunter who shares a cramped apartment with a crazy number of near strangers and admits it’s still a huge step up from when she was homeless. There’s also a powerful theme of consequences. One of Sully’s friends refuses to burn any spheres, because she’s suspicious of these magical abilities without any known drawback. She points out that the spheres really haven’t been around long enough for people to know if there’s some longer-term consequence, like negative health side affects. While I loved everything about this book, especially the shocking and dramatic climax and the well-handled ending, I couldn’t tell if it’s a standalone or the first in a series. While it wraps up nicely for a book in a series, I would be massively disappointed to discover we’re not going to learn any more about this magic system. I still have so many questions! Will McIntosh is an established writer, but this is a first young adult novel. Based on how much I loved it, I think it’s time I start reading some of his other books, too. If they’re half of riveting as BURNING MIDNIGHT, they’ll be high on my favorites list.